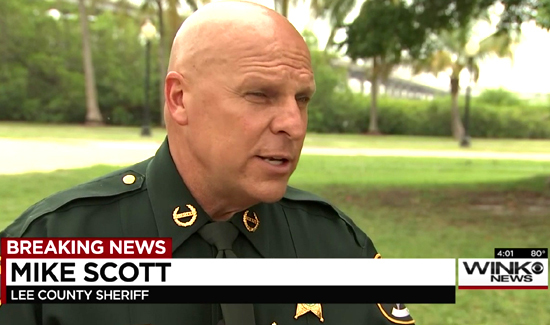 LEE COUNTY, Fla. — Lee County Sheriff Mike Scott is known for his aggressive crime fighting. But the sheriff is facing tough questions for passing out special deputy badges to celebrities and many of his wealthy friends — badges that have the power to influence the outcome of a traffic stop. Fox 4 obtained a list of those carrying special deputy badges in Lee County. It includes famous musicians, TV reality stars, and the local rich and famous. We wanted to ask Sheriff Mike Scott why you can’t get one, but he refused to face our cameras. The badges, ID’s, and the cases are issued by Sheriff Scott. Fox 4 obtained mailer-handouts showing Sheriff Scott actually promised during an election campaign to end the special deputy program. Our investigation shows Sheriff Scott never made good on that promise. Using the Freedom of Information Act, Sheriff Scott’s office provided Fox 4 with a list of 129 names of those in possession of special deputy badges. Some of the names may surprise you. Rocker and former lead singer of Bad Company Brian Howe, who lives in Fort Myers Beach. Rocker and four-time Grammy winner Pat Benatar and her rocker husband Neil Giraldo. And several Robertson’s from TV’s Duck Dynasty. But there are also dozens of local lawyers, business owners, restaurant owners and a Fort Myers heir to the Oakley sunglasses fortune. The sheriff’s department likened the special badges to ceremonial gestures, like getting the keys to the city. But Mike Levine, one of the DEA’s most decorated undercover agents in U.S. history and NY Times best-selling author for the book Deep Cover, doesn’t agree, since those that have special deputy badges are untrained civilians who could abuse the system. Law enforcement officials who talked to Fox 4 on the condition of anonymity say drivers over the years have whipped out their special deputy badges attempting to wiggle out of a traffic ticket. Some of them so well connected they even called the sheriff during the stop. Levine has testified across the U.S. as an expert in law enforcement policy. He tells Fox 4 that special badge programs are trouble, and should be dismantled for public safety. During a two year period between 2014 and 2015 alone, Sheriff Mike Scott spent $6,000 to buy those special deputy badges. And these special deputy badges? You paid for them, but you can’t get one unless the sheriff says so.